This paper proposes an effective test bed for a 380-V dc distribution system using isolated power converters. 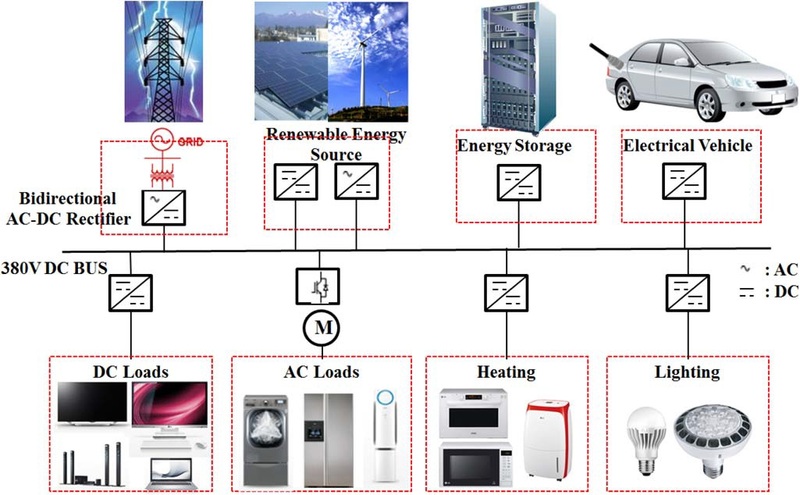 The proposed test-bed system is composed of a grid-interactive ac–dc converter for regulating the dc-bus voltage, a bidirectional converter for the battery power interface, a renewable energy simulator, dc home appliances modified from conventional ac components, a dc distribution panel board, and its monitoring system. This paper discusses three isolated power converters, i.e., a bidirectional ac–dc converter, a bidirectional dc–dc converter, and a unidirectional dc–dc converter for the effective power interface of a dc bus. These isolated power converters are designed using a dual-active-bridge converter and the resonant topologies of CLLC and LLC. The proposed test-bed system was implemented using a 5-kW bidirectional ac–dc prototype converter, a 3-kW bidirectional dc–dc prototype converter, and a 3-kW unidirectional dc–dc prototype converter. Finally, the performance of the test-bed system has been verified using practical experiments of load variations and bidirectional power flow, employing the prototype converters. Paper Selected as a Featured Arti..